Seated at a dressing table before a mirror, an aristocratic lady arranges her hair with the assistance of a young maid. 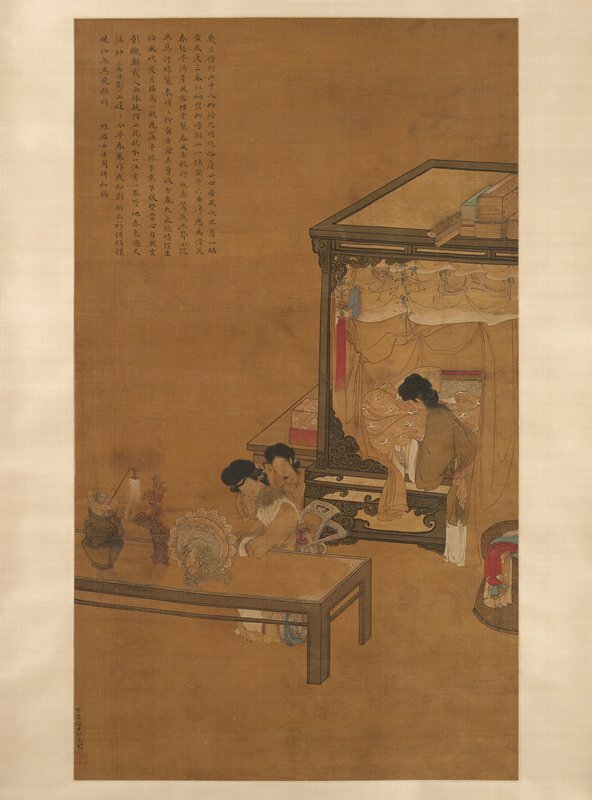 The accoutrements of the room, the ornate canopy bed, luxurious silk garments, decorative mirror, and flower vase as well as the books and scrolls on top of the bed characterize the occupant as a woman of culture as well as beauty. The theme of a court lady at her toilette is an ancient one and many professional artists painted scenes of this intimate activity over the centuries. Such scrolls were appropriate decoration for the women's quarters of upper-class households. Wang Qiao was from Suzhou in Jiangsu province. He excelled at painting figural subject matter and secular themes for the wealthy merchant families of the Suzhou region. The signature inscription reads: Painted by Wang Qiao on an autumn day in 1657. The long colophon was added in the eighteenth century by the woman painter, Zhou Qi.